As an American in Europe for more than fifteen years, I have a pretty clear idea of what makes America great and where we could also use some improvement. Contrast this month’s decision by the EU Court of Justice to permit employers to discriminate against employees based on religious practice to the U.S. courts’ repeated decisions to overrule or stay the sitting president’s orders to bar entry to nationals from six Muslim countries. And I am reminded of what I love about my country. An internal rule of an undertaking which prohibits the visible wearing of any political, philosophical or religious sign does not constitute direct discrimination,” the court said in a statement. This is, of course, the exact opposite of the right to freedom of expression, association and religion enshrined in the First Amendment to the US Constitution and guaranteed to Americans by more than two hundred years of legislation and jurisprudence. Europe has never experienced anything similar to our anti-discrimination laws, Civil Rights Movement, or other social movements to make the “the inalienable rights to life, liberty and the pursuit of happiness” of our Declaration of Independence available to all. Looking at the European court’s ruling with the eyes of an American lawyer, the Europeans have in fact perfectly defined and then legalized direct discrimination. But isn’t that the real difference between how Americans and European define themselves? A large part of the American self-image is based on living in a society that does not promote or prohibit religion; in theory thus allowing for new entrants to compete for the American Dream based on economic ambition, rather than pure cosmetic and ethno-cultural assimilation. Of course in practice the reality has been less than optimal, but at least as a society we are able to aspire to the principles of our founding, and with the help of lawyers and activists, improve step by step. Where were the religious freedom activists when the EU Court of Justice gave its ruling? Meanwhile, there were scores of pro bono lawyers camping out at airports around the country when Trump passed his first ban. On the other hand, Europeans have a lot of trouble figuring out what it means to be European other than simply being from Europe. So Europeans expect you as the new entrant to become just like them. To eat, dress, and talk like they do. In fact the biggest compliment a European can give you is “you are just like one of us”. Almost every single day of the week when I go to lunch an hour earlier than my colleagues here in Spain, I always get a comment about how strange I am for eating at 12:30, instead of at 2:00pm. Or for eating just a sandwich instead of a hot meal. It’s no doubt that after having cleansed themselves of practically all non-Christians in the 20th Century, Europeans find any other form of religious expression, foreign and confrontational. No one finds it strange that women have to wear a veil when meeting the Pope at the Vatican, but could never understand why a woman would voluntarily wear a Muslim veil, unless under male duress. They also forget that European women wore scarves well into the last century. 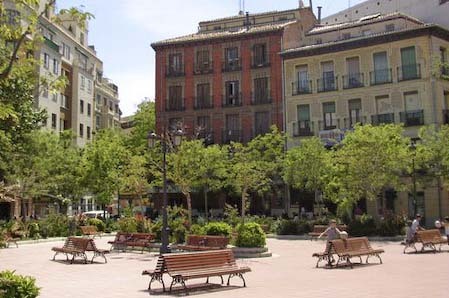 In Madrid, for example, on the feast day of their patron Saint Isdro, local women and little girls were the traditional Chulapa dress and headscarf. And in my old neighborhood of Chamberí, if you saw a woman dressed like she was from Saudi Arabia, she was usually a Catholic nun (and teaching at a publicly subsidized charter school). From an American perspective, having grown up in a multicultural town where my next door neighbors were Jewish, Iranian, Hindu, Black, Mormon, Nicaraguan, and Korean, there was nothing strange about having, for example, a Jewish or Sik boy sitting next to me on the yellow public school bus wearing a kippah or turban respectively or seeing my friend’s mother get the mail dressed in a sari. As long as you bought into the fiction of the American dream (hard work and meritocracy), you could be whatever religion you wanted. While I enjoy some of the significantly more civilized and advanced aspects of European life (few guns, low crime, free universal health care, generous vacation and paid maternity/paternity leave), when I read about the EU court permitting religious discrimination in the workplace by the same Je Suis Charlie hypocrites, I dearly miss my First Amendment right to be both free from religion and free to be openly religious. American innovation has been the envy of the world for the last century. Our ability to discover scientific breakthroughs, invent disruptive technologies and build successful companies that make those advances broadly available has been unparalleled. This creativity is the product of a culture that is uniquely open to new ideas, that encourages and rewards risk taking, that values people for what they achieve, not where they come from. It is also the result of a constant supply of talented people from outside the United States, many of whom came to this country seeking world-class education and an open society where they could thrive. America is more than just my rights story. It’s a global brand with its can-do outlook. It’s about being solution-driven, making things happen, and moving forward. It’s about striving to be the best. But, people around the world don’t buy the American flag t-shirt or beach towel because they think it stands for “America First” or you are not welcome or trusted here. For that, they could have worn a different flag on their outfit. Of all people, Mr. Trump of the Trump brand empire should understand that his words, travel bans, walls and nativism will have a major effect on the American brand. So it is to Trump and Trumpsters that I ask: when you talk about “making America great again” what exactly is it that made us great in the first place? And when the rest of the world looks at USA® what is that you want them to buy into? This will be my fifteenth year living in Europe. For many years, I was consistently shocked by the way Europeans could get away with all sorts of blatantly racist, anti-Semitic and otherwise offensive speech that we in America would consider either “politically incorrect”, socially unacceptable (though never illegal), or downright putting your job or personal safety on the line. For example, I simply couldn’t understand how the Spanish national basketball team could get away with something like this, how no one got fired over discussing Barack Obama like this (I actually sent numerous letters of complaint to Telecinco, with no response) (or like this), and generally how all things foreign are infantilized and treated as caricatures. In soccer stadiums, players and fans alike are constantly getting away with spewing racist insults at Black players. I recall a guy in Germany who I had just met telling me anti-Semitic jokes, and I had to do everything in my power not to clock him (and I am not even Jewish). Back in late spring 2008 just as I was reaching my apartment in the Madrid neighborhood of Chamberí, I noticed a strange looking vehicle driving down my street. As it got closer I saw that it was the Google Maps car. I stopped and stared it down, hoping to be immortalized on Google Maps street view. And sure enough, a few months later, there I was. At least until very recently. 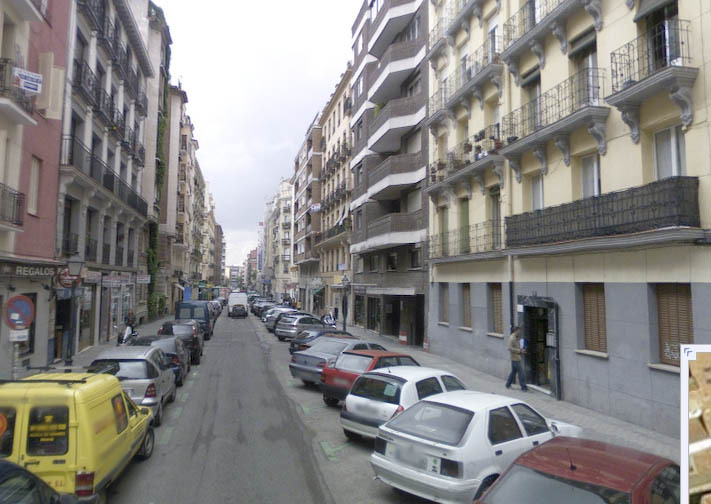 Google has recently refreshed its Madrid street view and I am no longer standing at the door. Coincidentally, just as my virtual tenure on Google Maps has come to an end, so have my 12 years in Chamberí. Tomorrow we move to a new address. It all started back in June 2000. I had been working in Washington, DC at a small boutique law firm specializing in environmental law. I enjoyed the work and city, but quite out of the blue – and against my will – I was becoming one of the few experts on the regulation of nutrient pollution in man-made water bodies (for those who care, Section 303(d) of the Clean Water Act). However that may sound – exciting or excruciating – I was in my late 20s and didn’t want to be typecast so early in my career. In other words, the time was ripe to make a change. I chose to move to Madrid where I had close friends and a plan: do an MBA at Instituto de Empresa right when European business schools were taking a giant leap in competitiveness vis-à-vis their American counterparts. So, in the Spring of 2000, I co-published an article entitled “Politics, Pollution and TMDLs: New Directions in Point and Nonpoint Source Liability for Watershed Restoration” in a now long-defunct trade magazine that no one ever read, and by summer I had quit my job , moved to Spain and the rest was history. 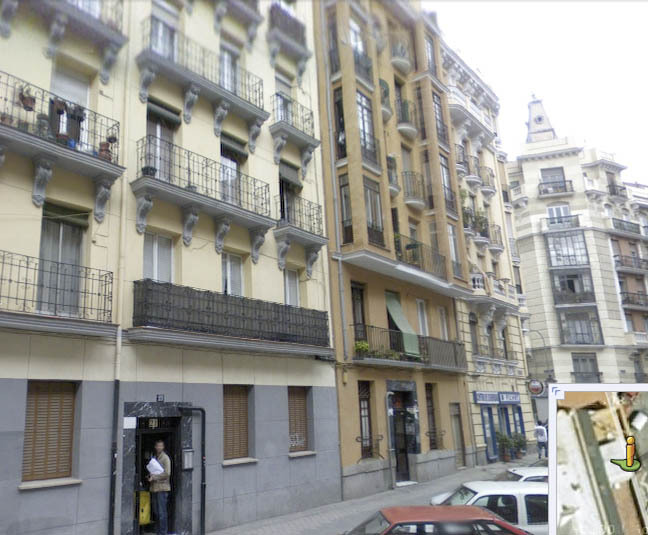 While looking for an apartment in Madrid, I moved in with an old friend and his then girlfriend in Chamberí. It took me two months – during which his girlfriend didn’t know which one of us to strangle – until I finally found a nice apartment in the very pijo Salamanca neighborhood. But after one year in Salamanca and just as my MBA was coming to its end, my landlord – taking advantage of the end of Peseta – was in a rush to sell off the apartment, and I was left homeless. I had no idea whether I was going to stay in Madrid or move back to DC, but I needed some time. My friend who I had stayed with in Chamberí had just broken up with his girlfriend and – against what you would imagine – encouraged me to move in with her and help out with the rent until I could figure my next move. To make a long story short, she ended up taking a job in Barcelona, and I took over the management of the MBA program I had just graduated from along with her apartment. In the meantime, I became a fixture in my neighborhood. I have my vegetable market, butcher, cheese guy and fish monger. I do the vast majority of my shopping locally. And when I walk down the street, everyone says hello and knows my name. It helps that my son was born at the hospital down the street, and all of the old ladies want to play with my curly-haired little boy. While living in this house, I married, changed jobs three or four times. I have gotten good news and I have gotten bad news, and as mentioned, our son was born. I have watched as the local kids were born and grew up, and I have seen my neighbors grow old and pass away. I once even saw a neighbor begging for money in the metro. And isn’t that what is so special about living in a city? In the U.S., we don’t really have cities. By cities I mean a place where people of all ages and classes live in the same buildings, walk the same streets and buy their groceries in the same stores. In Chamberí, I have had all of these: the old ladies, babies, teenagers, immigrants in the cheaper interior apartments and the bourgeoisie with their balconies. And of course, outside you see beggars and drunks. You are exposed to all faces of humanity. But now after 12 years, it’s time to move on. We’re moving within walking distance to where my son will start school in September. And we are very excited to move to a bigger, more comfortable space. Nonetheless, while it is technically still within the city (and definitely a far cry from the American suburban life), we will lose my querida Chamberí barrio lifestyle. Twelve years. That may be the longest time I have ever lived at one address. Almost as long as the house where I grew up. I don’t feel anything close the attachment I feel for my childhood home, but I will definitely cherish its place in my life. Goodbye to 12 years in Chamberí. When I first started the original Grave Error back in 2006, my intention was to write silly little digressions relating to my every day life. I think I was fairly successful in that department, but over time, my posts got more and more political, especially as a result of the 2008 U.S. Presidential Elections. Since then I have probably spent much too much time writing about U.S. politics and foreign policy, especially for an American living in Spain. For the reader, it could have been more interesting to hear more about European politics from the American perspective. That’s not to say that I haven’t written about life in Spain. I have, but for whatever reason, what has moved me the most over the past few years have been issues relating to my own government and society’s remarkable hypocrisy with respect to civil liberties, the economy, guns, and foreign policy. And of course, I am fully aware that my writing on these topics not only bores my family and friends, it simply doesn’t have much of an audience for those, once again, interested in reading what an American ex-pat has to say. Now with Spain really falling apart with no end in sight, I am going to make an effort to switch gears and write more about the country I have lived in for the past 13 years. I will still write occasionally about what irks me in American political discourse, as well, as on literature, music and fútbol.